There were 669 press releases posted in the last 24 hours and 154,030 in the last 365 days. WAUCONDA, ILLINOIS, USA, November 28, 2018 /EINPresswire.com/ -- Youth seem more distant and disconnected from society than ever, and many believe technology like smartphones and the internet are to blame. USSSA volunteers like Martin F. Garcia give youth a healthy alternative and teach them to become better athletes and outstanding society members who respect and build relationships in their communities. Today, youth are exposed to a world of information through the internet and social media, resources they can access anytime from their smartphones. A new study reveals smartphone use has gone way up in kids and teens, with as many as 95% having access to a smart device.1 In excess, smartphone use can have a negative effect on youth mindset. USSSA volunteer Martin F. Garcia intends to reverse negative thinking in kids and instill lasting values through sports engagement. The internet has its pockets of negative media, graphic material, and unmonitored communications. It can be dangerous and depressing, especially when youth have unrestricted access through their smart devices. Kids may be exposed to online scamming, internet bullying, biased news articles, identity theft and more, which may cause upset, distrust in authority, and tension between youth. Associations like the USSSA may be the answer. With their help, kids have fun, improve their talents, compete in a safe environment with their peers, and grow as individuals. Martin F. Garcia and other volunteers serve as coaches, sponsors, mentors, and fans for USSSA sports games to give youth as authentic a professional sports program as possible. The USSSA is headquartered in Florida, but the organization hosts competitions, gatherings, and various sports games across the country. They partner often with nonprofits and sports conferences for all ages and categories. Martin Garcia believes there’s a healthy sports outlet for every kid. And with regular games, team support, coach mentoring––plus awards and trophies to look forward to––he hopes youth will have less desire to spend their free time browsing the internet. 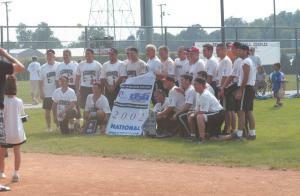 The USSSA asks for help from qualified professionals who can volunteer in youth programs and be positive role models. Martin Garcia, for example, exemplified his own sportsmanship and talent through an impressive career. He’s a 4-time Softball National Champion, playing shortstop, second base and third base positions. He shares his industry insight with his team and teaches them to respect each other, and to be humble whether they win or lose.